Iceboats were first invented around the mid-1600s in Holland. They were sailboats fitted with runners. They were designed to carry goods over the frozen canals of Holland. In 1790, Dutch settlers introduced the iceboat to the Hudson River. Soon iceboating became a popular sport. The Poughkeepsie Ice Boat Club was the first iceboat club in the United States. It was founded in 1861. Iceboating quickly spread across the United States, and it remains popular to this day. How does the existence of leisure time influence culture and economy? Describe the scene in the photograph and explain how the existence of leisure time changed the American culture and economy. 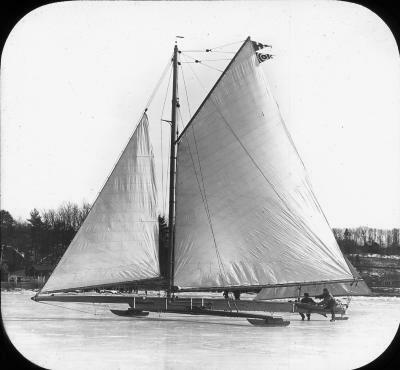 An iceboat under full sail on the frozen Hudson River near Hyde Park in Dutchess County, New York, circa 1900. What is unusual about the boat in this picture? Who started the Hudson River Ice Yacht Club in 1869? Science: Which would travel faster: an iceboat or a sailboat? What would speed depend on?